The Bowron Lake Canoe Circut in Bowron Lake Provincial Park is considered one of the premiere paddling circuits in Canada. Being that it is internationally renowned, people travel from around the world to paddle this circuit. 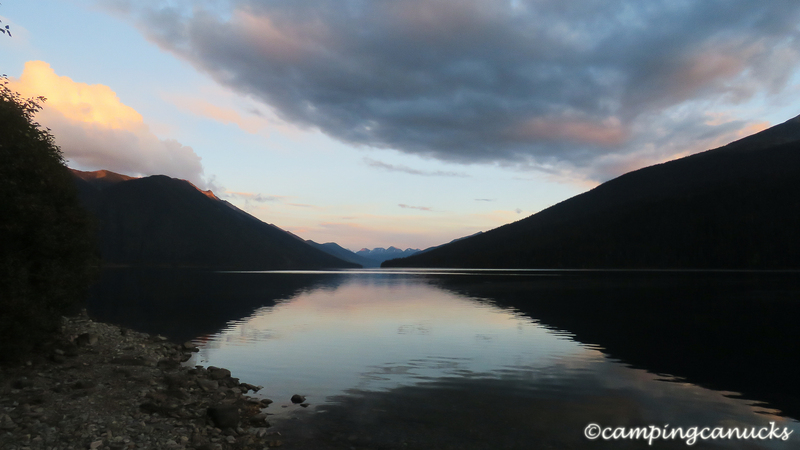 In fact, many times over the years, we have spoken to people in the backcountry who have come to Canada and many of them have mentioned that the Bowron Lake Circuit is a big part of their visit. 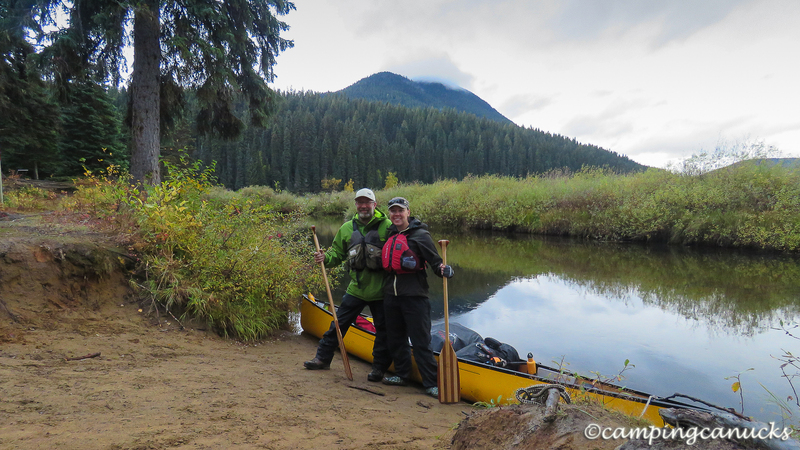 Being that we live only a few hours away, and having not done it ourselves, we made 2015 the year to tackle this famous backcountry canoe trip over a seven day, six night trip during mid-September. We chose September because there are less people on the circuit and by this time of year, all of the bugs and mosquitoes are gone. Of course, the weather also tends to be a bit sketchier so we had to plan accordingly for uncertain conditions. This is an epic trip and requires a fair amount of planning. 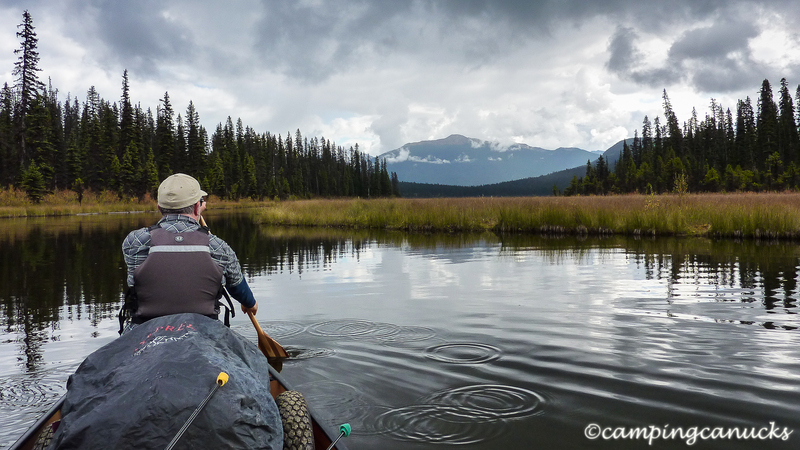 Aside from many days of paddling and all the conditions that can come about from being on large lakes, such as bad weather and storms, there are eleven portages that must be done at various points along the route. As well, there are a couple of rivers that must be navigated which do include some whitewater sections, deadheads, sweepers, and other hazards. The total distance is 116 kilometers plus any additional distance that one can accumulate from side trips and some hiking. While we have spoken with people who have done the trip in as little as three or four days, most people take seven to ten to fully enjoy the experience. And obviously, careful planning needs to take place to ensure you have enough in the way of food and provisions for this many days in the backcountry. For this trip, we brought along a cooler which gave us five days worth of fresh food, plus some of our homemade dehydrated meals for the last couple of days and as spare meals. Any paddlers who do this trip must register and must also attend an orientation session prior to being allowed to proceed onto the circuit. After spending the night at the nearby front country campground, we elected for 9am on a Sunday morning as our time to get underway. It’s also of note that there are weight restrictions regarding how much you are allowed to put in your canoe/kayak. Any weight over and above the allowed limit must be carried by some other means. We chose to bring along backpacks to carry things like the tent, clothing, and sleeping gear, and used the canoe to transport the heavier items like the food when we portaged. Once given the go-ahead to start, the first section is, naturally, a portage to the first lake, Kibbee Lake. All the portage trails were quite a mixed bag, we were to find, with some sections being relatively solid but with many areas being very muddy. There is no doubt that pulling a loaded canoe down a trail in mud over your ankles is not actually a good time and good waterproof boots or shoes were recommended. But the splendour and the sheer beauty of the lakes and mountains more than made up for the difficult stretches. Fortunately, there are only a few sections that are a couple of kilometers long, with most of the portages being fairly short. 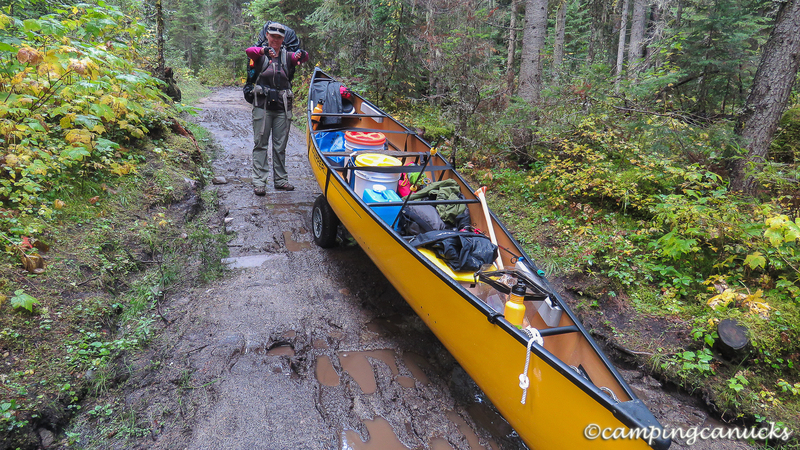 We found at times that it took us longer to get ready for the portage than to actually do it. 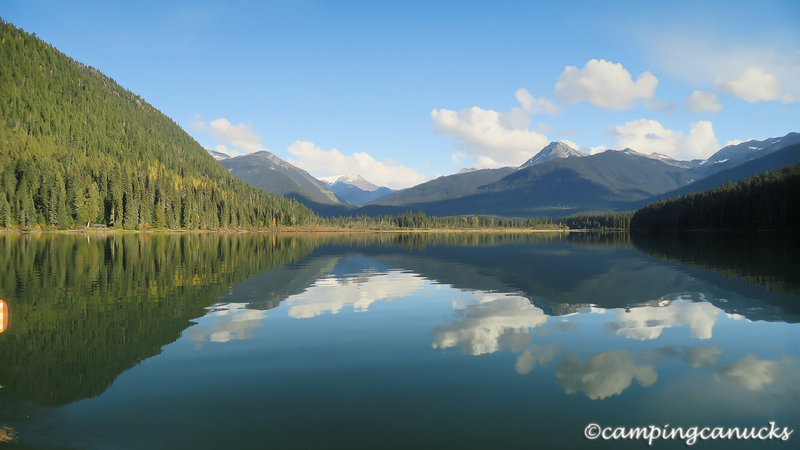 Since this was mid-September in the Cariboo Region of BC, we expected a lot in the way of rain and on the first day out, it didn’t disappoint. For much of our day on Kibbee and Indianpoint Lakes, we paddled and portaged through a veritable deluge of cold rain that almost bordered on sleet. Good warm and weatherproof layers are a must on this trip. At the orientation, we received a map marked with the wood lots and passed the first one on Indianpoint Lake, where we stopped and threw some logs into the canoe. 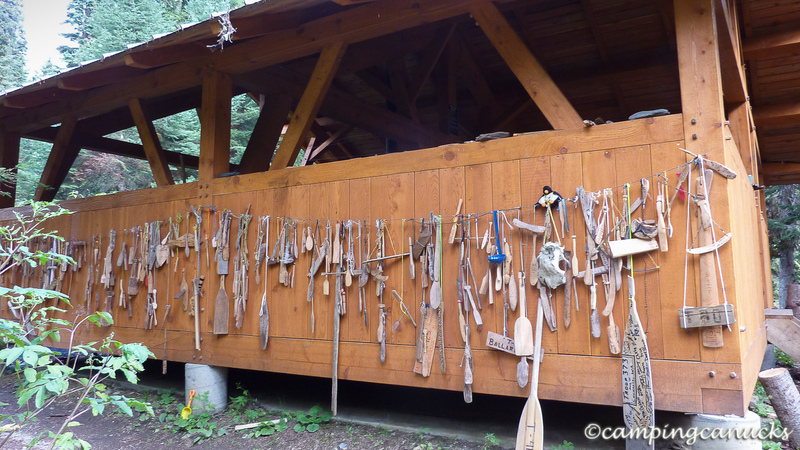 We would suggest always stopping and grabbing some wood to take along to your campsite as we found there were many times in which there was no wood at a campsite. It goes without saying that you will want to bring along an axe for this trip since the wood is bucked into logs that you’ll have to split yourself. We spent out first night at a site on Indianpoint Lake and enjoyed our first of many evenings in which we had a site to ourselves. After a short paddle on the second day, we hit the next big portage that brought us to Isaac Lake. This lake is the longest in the circuit coming in at 38 kilometers so we had planned to spend two days paddling its length. 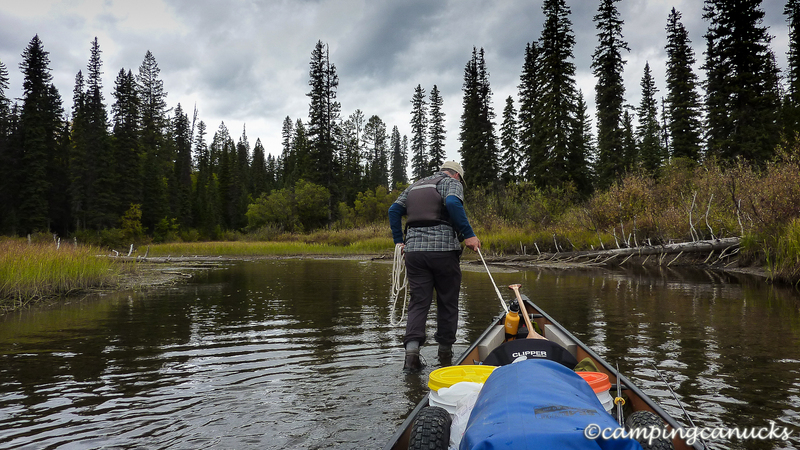 We figured we would just paddle as far as we felt like on the first day and just pop into a site somewhere along the way. After a bit of rain in the morning, we got a break and actually had some sun shining on us for a few hours. And luckily, there was no real wind blowing as Isaac Lake can get very stormy in bad weather. This day was all about paddling as we slowly and surely made our way down the lake until we arrived at a site about halfway along the length of the lake. We didn’t have this site to ourselves as there were two others there already spending the night in the cabin, but we found ourselves a good place to pitch the tent and camp for the night. It rained throughout the night but we found that it had mostly stopped by the time we were getting up the next day. 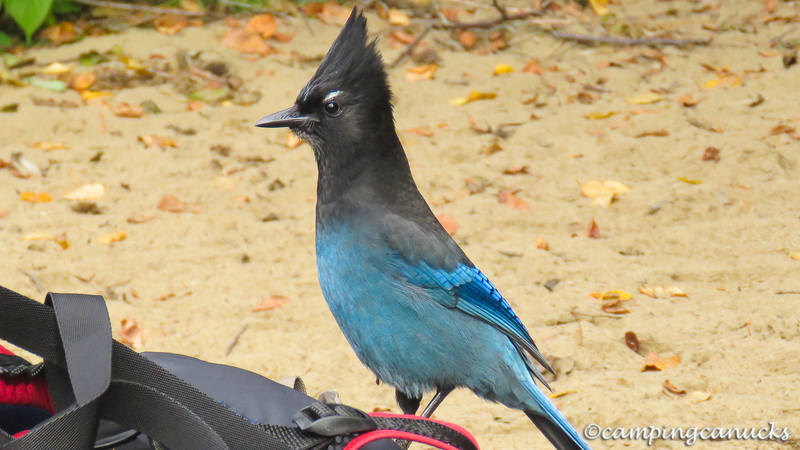 It’s always a bit easier to face the day when camping when you do not have to break camp in pouring rain. We did, however, have to pack up a lot of wet gear. That really makes one appreciate canoeing as there is no need to have to load up a backpack and carry everything wet. We intended to get to the end of Isaac Lake this day and make the short run through the rapids down the Isaac River before reaching the next portage leading to McLeary Lake. The biggest rapids are along the Isaac River and we have heard it can be quite a run down earlier in the season when the water is high. 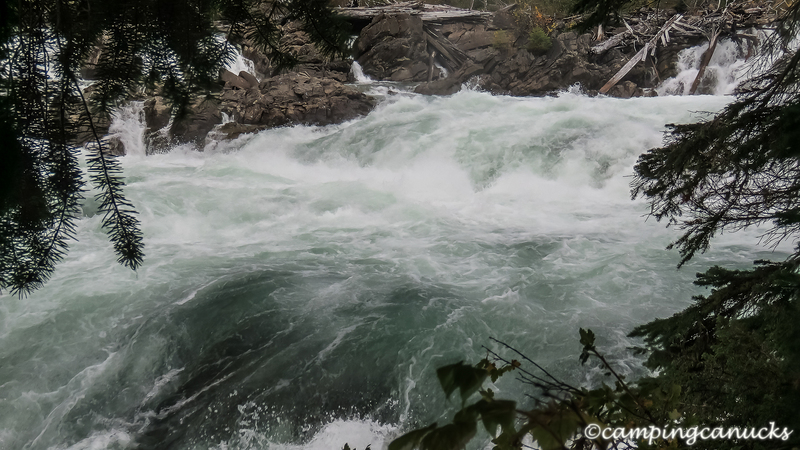 At this time of year, though, the river was not a raging torrent and we found that it wasn’t terribly difficult to run The Chute and navigate the rapids to the lift-out spot. 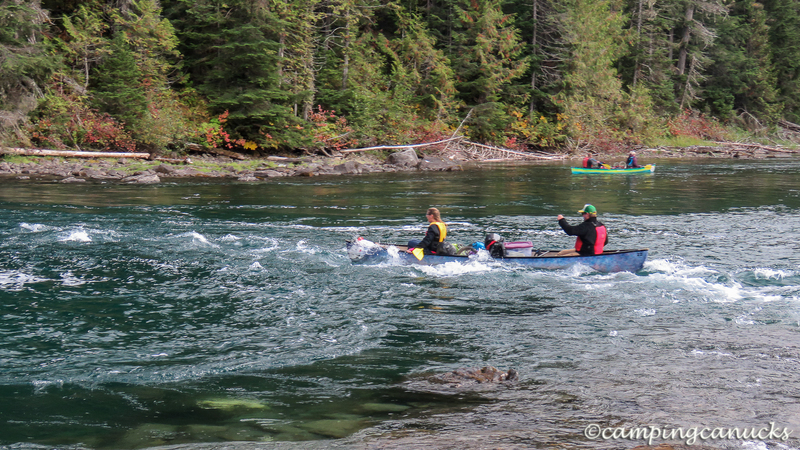 It’s not possible to actually paddle down the whole length of the river due to waterfalls and steep chutes. The next portage was a hard one as the trail was often narrow and in several places, quite steep. There were sections where we had to really hang onto the canoe so that it didn’t roll too fast down the hill around a few sharp corners. 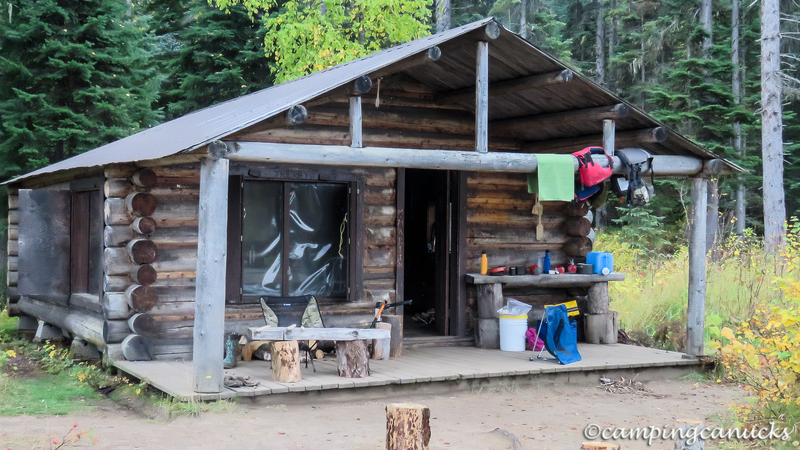 After much cursing, we arrived at McLeary Lake, where we quickly loaded up and headed over to the next site, hoping to be able to stay in the cabin. The sun was starting to set when we arrived at the site, only to find that another group was already there and that they were using the cabin. It’s wasn’t a big deal as there was plenty of room for us to pitch our tent, and as we had lots of wood along, we shortly had a good fire going that we could all share. That night, we barbecued steak and salmon, much to the amusement (and jealousy) of the two gentlemen from Washington State who were sharing the site with us. 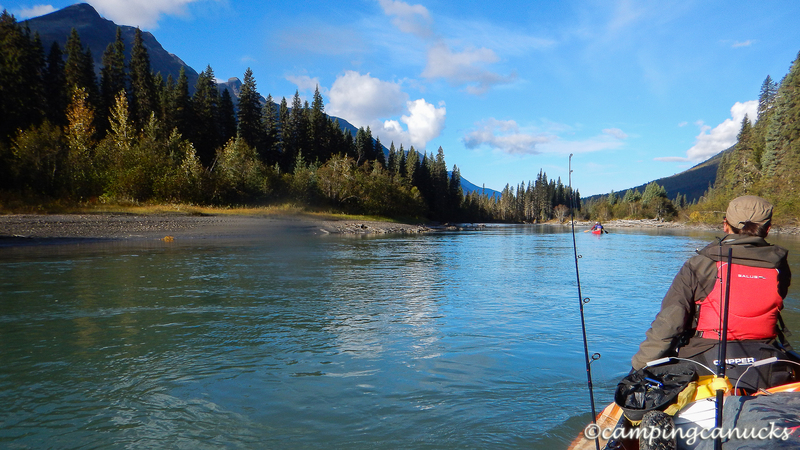 The Cariboo River was the next order of business on our fourth day out after we had our breakfast and loaded back up. While the river is quite placid late in the season, it is littered with sweepers and deadheads along its length and does require some caution to navigate to avoid the hazards. As our new American friends had both been on this route before and offered to lead the way, we gratefully followed them down the river to Lanezi Lake, where we parted ways with a thanks and a wave. Lanezi Lake feels really remote and many of the camp sites along this lake felt wild, being hacked out of the thick wilderness that runs the length of the lake. Lanezi Lake is also quite silty which was in stark contrast to the lakes to the north and east which are quite clear. We made a couple of stops along the way to pick up wood, have lunch, and to just generally check out the area but we had no plans to camp along Lanezi Lake as we were heading onto aptly named Sandy Lake where we had planned to look for a camp for the night. 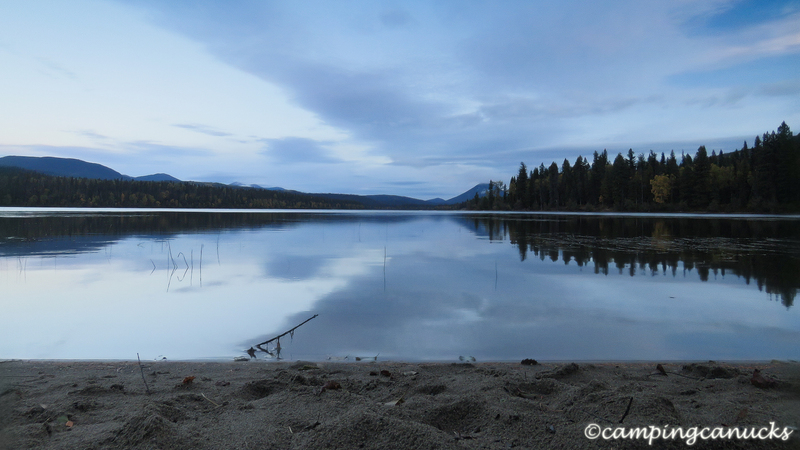 Sandy Lake is connected to Lanezi Lake by another short stretch of the Cariboo River, although the only hazard on this stretch turned out to be the many sandbars as a result of the low water. 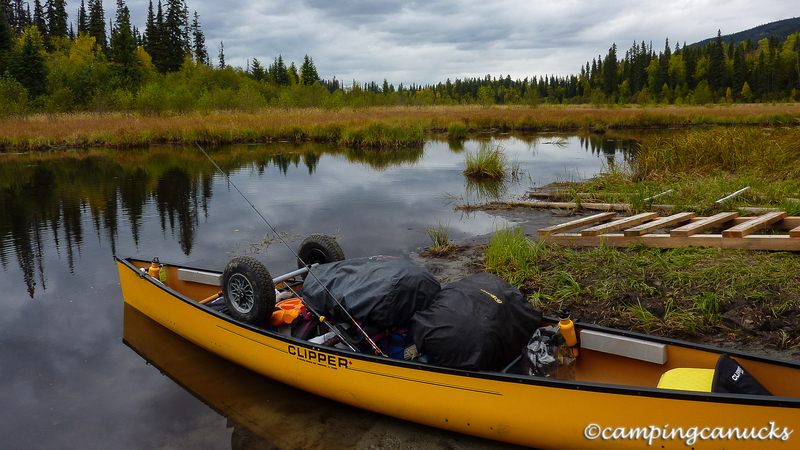 Once we reached Sandy Lake, though, high winds and whitecaps made for a bit of hard paddling before we decided to stop and take a break at one of the camp sites to wait out the weather. We also met a German man taking a break who was soloing the circuit on a ten day trip, and whom we were later to meet again and share a camp with the next night. 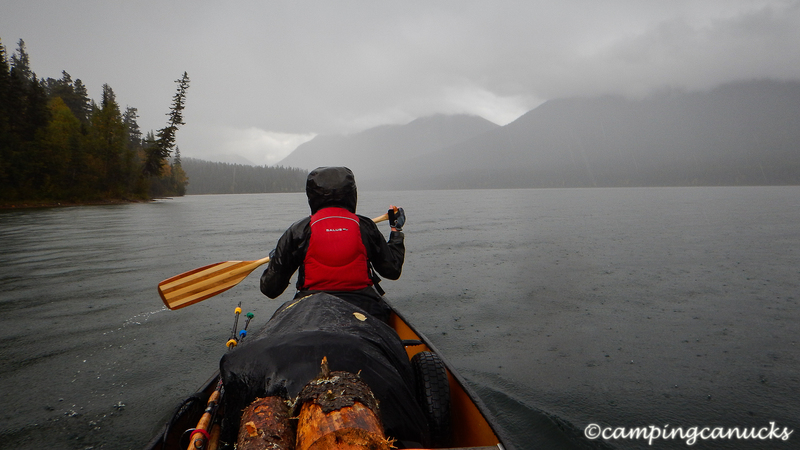 Once the weather let up a bit, we hopped back in and paddled our way to the next camp site on Sandy Lake where we spent the night. We were now five days into the trip. We didn’t have a plan for where we would spend our next night so just we figured we would see where we ended up that day. 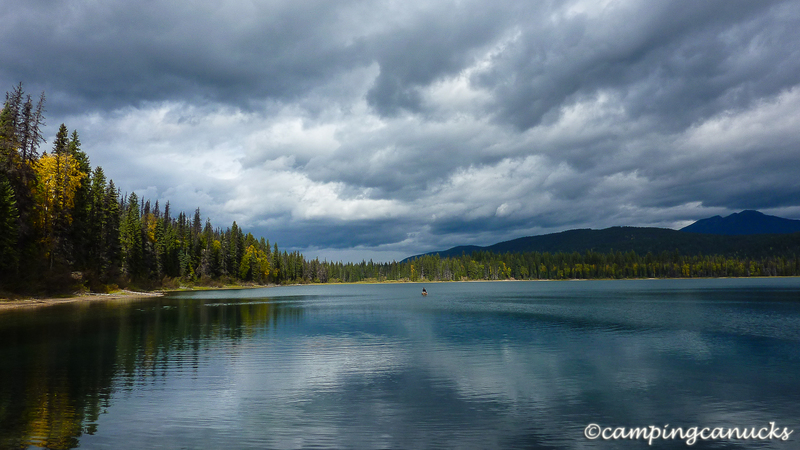 For starters, we made our way over to scenic Unna Lake where there is a short hike to over to see Cariboo Falls. 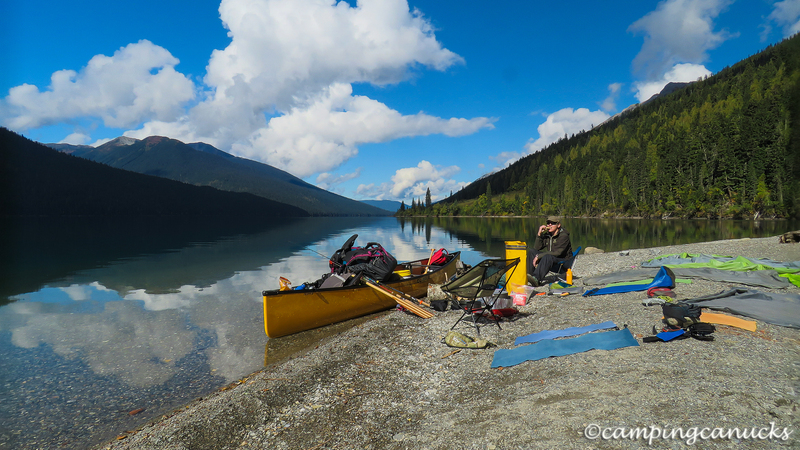 Being that Unna Lake is the last lake of the shorter western canoe trip that can be done in the park, we expected to see more people but we arrived at Unna Lake’s camp sites to find that we had them to ourselves. In the end, we decided not to stay here but to check out the falls and continue along our way and finish off the last three portages on the circuit. That would bring us to the Spectacle Lakes, where we would be portage-free for the last two days of our trip. After we put the last of the portaging behind us, we arrived late in the afternoon of our fifth day at the camp site at the southern end of the Spectacle Lakes. 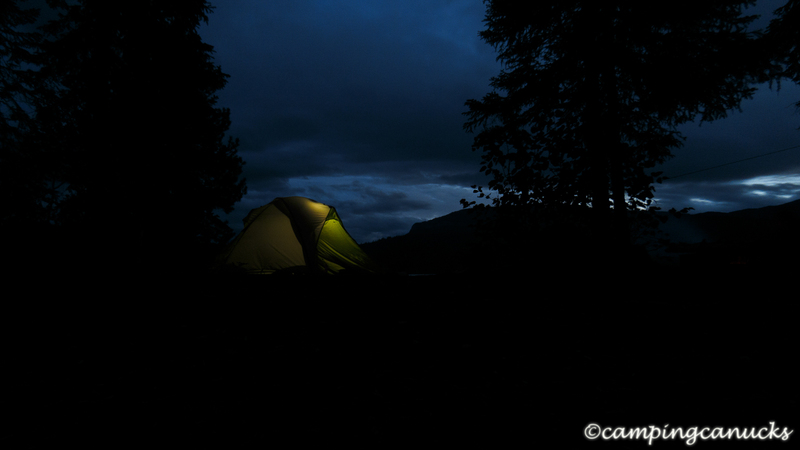 The German paddler was already camped as we setup our tent and got ready to settle in for the night. Since the wind was quite bad at this point, we combined our resources and before long, the three of us had a nicely sheltered off area where we could sit out of the wind, cook, and enjoy the fire for the night. He was an interesting fellow who lived in Switzerland and was actually a scientist who was to attend an international science conference in Vancouver. He had come to Canada a few weeks early to spend ten days canoeing the circuit. And as this was a once in a lifetime experience in all likelihood, he had a lot of camera gear with him and had spent much of his time photographing the many sights along the circuit. Heavy rains eventually drove us to our tents that night where we awoke in the morning to find bear tracks in the sand less than 10 meters from our tent! Fortunately the bear did not actually walk through the camp and disturb anyone in the night. It was another cloudy day for us, so we just ate, got ourselves packed, and hit the water for our sixth day on the trip. 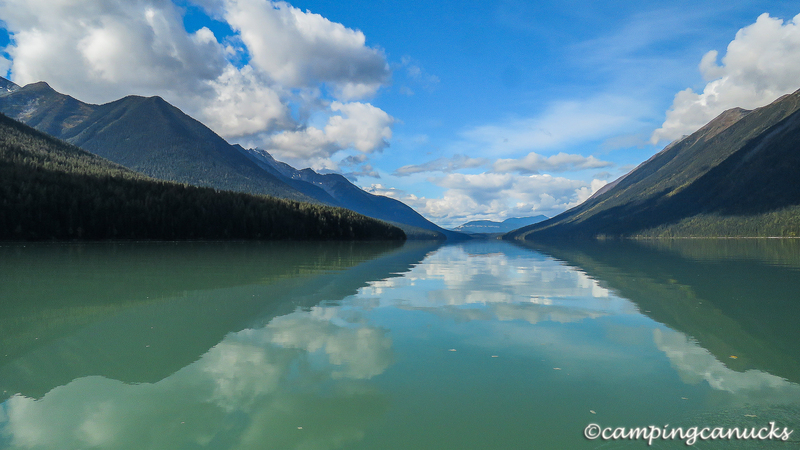 Much of this day was spent in smaller, shallower lakes where there generally tends to be moose hanging around. On this trip, though, we didn’t actually see anything bigger than an otter. 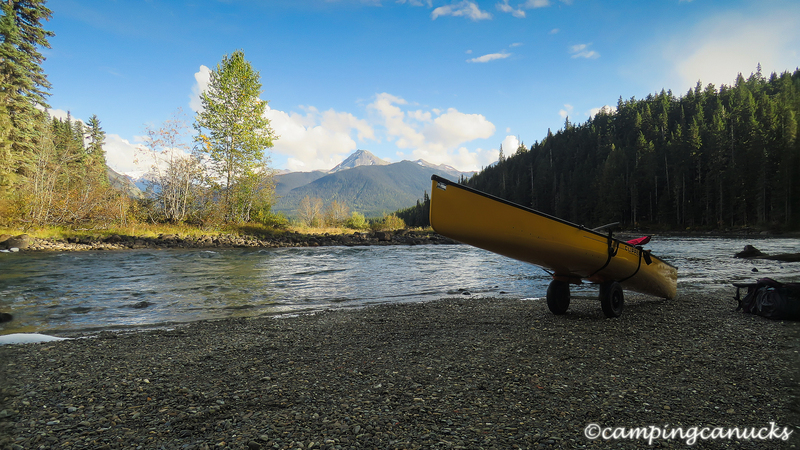 A full day of paddling brought us to the last of the campsites and the Bowron River, where we made our way through channels until we ended up at the Bowron River cabin. After days of rain and soggy gear, the cabin was a welcome site. We ended up having it all to ourselves for the evening, which was nice as it allowed us to hang everything up to dry. And as the cabin had cots and a bunk bed, we were in the lap of luxury spending the night out of the rain with a nice wood stove fire to keep the cabin warm and dry. It rained through most of the night, so we weren’t really surprised to have to get up to another day of clouds and rain but of course, it was a lot easier to get going in the morning after a night in a cabin. As this was our seventh day on the circuit, we were eager to get underway and get the trip finished. 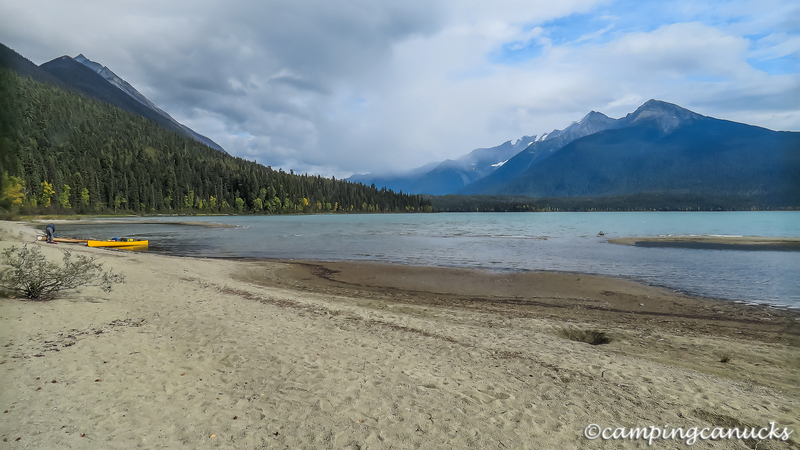 There was a strong wind blowing as we made our way along the Bowron River as we made our way to Bowron Lake. 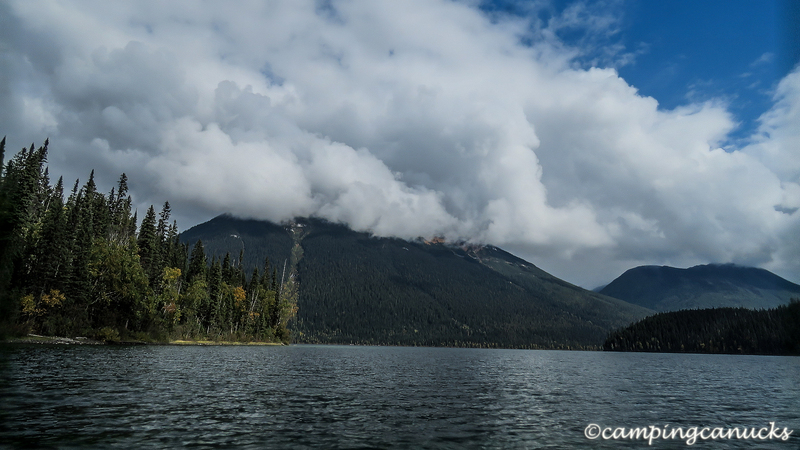 At this point, we made a mistake and made our way to the west side of the lake, which meant that we had to fight strong winds and whitecaps for the next couple of hours as we were getting hit by a strong broadside wind until we made it to the north end of the lake. In retrospect, following the eastern bank of the lake would have meant we would have had a tail wind and could have just let the waves push us along back to the pullout. 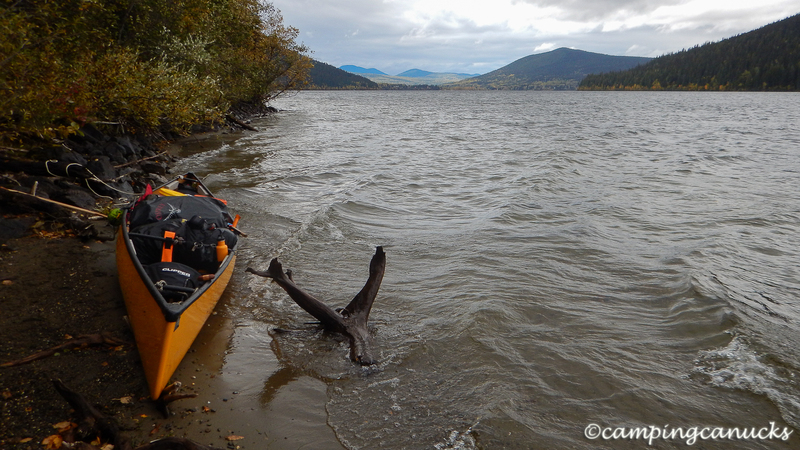 In any case, after some breaks along the way and close calls fighting some of the roughest waters we have encountered, we made it safely back to the canoe launch. It was a relief to reach the launch but it was also a bit sad that we had reached the end of this trip. That said, the thought of fresh food and the promise of a shower (the first in eight days) made us eager to hit the road and make our way home. The Bowron Lake Circuit is quite possibly one of the best trips that we have ever made, both on and off the water, and we are determined to come back in a few years and do it again. There was some pain and adversity along the way but in the end, the many good parts of the trip more than make up for it. 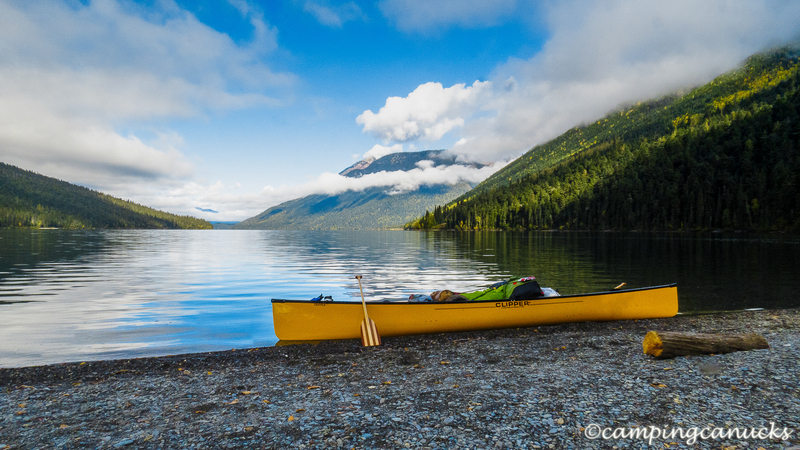 We would highly recommend this trip for anyone who is looking for a Great Canadian Paddling Adventure in British Columbia. More pictures from the trip.